I don’t recall ever having been sick for Christmas, and I’ve been thinking about it because yesterday I started coming down with what I call the creeping crud. Of course, if you hang around here long enough, you’ll hear my idiosyncratic colloquialisms over and over. I’m loading up on the orange juice and resting, so I have way too much time to think, and one can only tolerate so many Lifetime Christmas movies. I’m sure we’ve talked about all this before, but it’s what’s on my mind right now–thoughts of Christmases past and those traditions we’ve either carried on or cast aside. 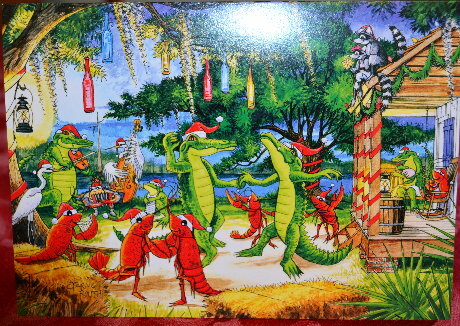 The Captain’s bayou family was so large and the house so small that they never had a Christmas tree. If they had room for any holiday adornment at all, it was a bough from the possum-haw stuck in a bucket in the corner of the room or in a jar on the table. There weren’t many store-bought gifts, either, but one thing they would most certainly receive was an apple and an orange in the sock they placed on the living room floor the night before. The Captain continued this tradition when the kids were small. Since there were no great Billiot traditions, I was wide open to instill mine upon our household and the kids. But from the time DoVi was born until both my parents passed away in the late nineties, we sojourned up to north Louisiana every Christmas, where they made the holiday extra special. But I think I’ll back up and recall some childhood memories, first, okay? Up until I was about 14 years old, we spent every Christmas Eve with our two paternal grandmothers, who lived together in a tiny old house. It didn’t matter how many of us there were, we never felt crowded. They had a tiny tree, and we’d exchange gifts and eat the most marvelous food. They always had these little miniature slices of party rye bread spread with pimiento cheese. Remember those? Of course, the Grandmothers had a manger scene in their living room, too. After they passed away, the manger scene was passed down. Not sure who has it now, but we’ve always had some sort of little manger scene displayed in the house for Christmas, and I’ve kept that tradition. And every year, the child who had just learned to read, read the story of the birth of Christ from the Bible, a tradition we’ve sadly gotten away from. I realize now they did that because we didn’t attend a Christmas Eve service. After both grandmothers died, we carried on the tradition of getting together on Christmas Eve with Daddy’s brother and his family, alternating going to their house one year, then at Mom and Dad’s the next. We drew names, so gift giving wasn’t a big financial burden, and everyone received a gift. Aunt Joni made the best chocolate chips ever, which Mom could never quite duplicate. And somehow, fireworks became part of the tradition. Some of the kids couldn’t wait to set them off, but me? I pretty much stuck with sparklers. Daddy insisted on helping Mom make divinity every year, and I think they burned up her mixer each time. I’m not sure why they went to all the effort, because Dad was pretty much the only one who ate the stuff. My favorite was the easy chocolate fudge Mother made with semi-sweet chocolate morsels and marshmallow cream; oh and don’t forget the chopped pecans (not walnuts, as no self-respecting Louisianian would use them!). Then there were her Martha Washington’s, the non-bake chocolate oatmeal cookies, the butterscotch haystacks, and the Hello Dolly bars I learned to make in later years. Oh, and we still buy a box of chocolate covered cherries in Dad’s honor every year. In Mother’s honor, it’s a tin of those Danish cookies. Gosh, why is it we kill ourselves with all these sweets at Christmas? I don’t know, but it sure was fun! I’ve also never been able to figure out why in one month’s time we have turkey and dressing for two major meals, and we never have it any other time of the year? Thanksgiving and Christmas should be about six months apart so we can appreciate those special foods more. Then again, what’s stopping us from cooking those things any time we feel like it? One year after Mother died, it was Daddy’s turn to host his brother and family for Christmas Eve, he told LilSis he wanted to make it really special. Because Mother always did the planning, shopping, and cooking, he was a little at a loss about where to start. For some reason, I don’t have a vivid recollection of this celebration, maybe I was just missing Mother way too much, but it resulted in LilSis following his new tradition each year ever since. You’ll never in a million years guess what it was. Bugles. He served Bugles. Those bugle-shaped chips, made out of God knows what. She knows the back story better than I, because she was there, but somehow he thought Bugles might make a nice addition to his Christmas Eve spread. And then there was something that my Great Aunt Dottie made just for Daddy, and the years he didn’t get any from her, I could swear he pouted. Date-nut roll. I bet most of you have not even heard of that, much less eaten any. Or maybe you have? He was a sucker for those little two-inch square fruit cakes that come from the grocery store. That’s the item that screams CHRISTMAS TRADITION to me when I’m shopping this time of year. Granted, nobody really likes all those candied fruits, but I buy one every year and have a little chunk with my coffee in Daddy’s honor and memory. I must be having an off year, because I never saw any at Rouse’s this year. I’ll have to look after Christmas when I buy the cabbage for New Year’s Day. The one new food tradition that I instituted with our kids, and we will be doing again this year, is sausage-cheese balls, cinnamon rolls, and spiced tea or coffee for a casual Christmas morning breakfast after we’ve opened gifts. When my kids were smaller and the budget tight, of course, we made our own wrapping paper from the endroll of the newsprint, which we scavenged from behind the Houma Courier building. We rolled the paper from the kitchen and then all the way down the hall, and we lined up along the paper on our knees, Then, using a few basic paint colors, paper plates, and sponges in holiday shapes, we decorated while Christmas cassette tapes played. Ever since Thanksgiving, 101.9 FM has been playing Christmas music, and I absolutely love it. I’ve listened to nothing else since then until now while driving. When I hear Bing singing so smoothly about how he’s dreaming of a white Christmas or how he’ll be home for Christmas, I hear Daddy’s crooning voice instead. It’s the old Gene Autry songs that make me happy, though, and I sing every word; because when I was little, someone gave me a little record player, and then someone gave me a Gene Autry Christmas album, and y’all, I think the needle wore grooves in that album from playing it so much. As far as gifts for my kids, I was always very conservative, and I did homemade things when possible. I never wanted them to come to think of Christmas as the “gimme holiday”. And they took turns opening a gift one person at a time, knowing who it came from and thanking them if they were present at the time. When we lived in town, weeks before Christmas, I’d have them each gather up at least two toys that they wanted to give away to another child. Then, we’d load them all up, drive around the neighborhoods until we found kids outside. They’d then decide where we would stop, and we would share the toys with them. They came to know that the only way they would get new toys for Christmas is if they shared their old ones. As a child, the one gift I received that made a lasting impression on me was a bright red Schwinn Spitfire bike that I received when I was about six. I still remember running out and riding it down the sidewalk in my pajamas. (Or maybe I just remember them telling me that’s what I did?) Isn’t it odd how we don’t really recall all the gifts that were so painstakingly purchased for us through the years? Once my parents were gone, I did my best to carry over some of our family traditions and make Christmas special for my five children, because they loved Christmas at my parents’ house as much, if not more, than I did. I fear, though, that no matter how hard I try, Christmas has never been the same without the joy my father brought to the holiday. His presence is sorely missed, even now. Lastly, one of my favorite things about Christmas is the end of the Eve service, when the church lights dim, while candles cast a glow on reverent faces, singing “Silent Night, Holy Night”. In recent years, I can’t hold back the tears as I gaze down the pew at my two youngest sons who never got to know my parents and Christmas at their house . . . . and fear I have fallen way, way short of recreating their joy. Although missing our loved ones can make the holidays seem sad and lonely, we have to try to keep them with us through our memories. Maybe I will start a new family tradition of asking each of my older children to share one special Christmas memory from when my parents were alive, and the two younger ones a memory of Christmas with us. That way, I can cherish their memories, and help them keep their memories alive, passing them down to their own children one day. So, I think I finally understand the full meaning of the words, which I’ve sung hundreds of times, always hearing Daddy’s Bing-like voice in our old house, “I’ll be home for Christmas, if only in my dreams.” Grandmother Owsley? Grandmother Vi? Uncle Tommy and Aunt Joni and all the cousins? Aunt Betty and Uncle Whoopie and the girls? Butch? Mother? Daddy? I’m dreaming of you this Christmas. So, be of good cheer and after you’re up to your eyeballs in eggnog and fruitcake, take a break, sit down here, and share with us some of your traditions–old, new, remembered, forgotten, loved, hated, hilarious, and so on. I love reading about your lives and look forward to a cozy Christmas evening reading your comments, after all is quiet on the home front. Hope you feel better and want to wish you and yours a very merry Christmas.. Thank you, George, but as often happens with the creeping crud, I had to get worse before better, and I ended up in bed most of Christmas Day. I’m hope that I’m now on the other side of the worst! I hope you had a great Christmas! Curiously the “creeping crud” was an affliction well known in the 5 boroughs of N.Y….Sad to learn it’s made it’s way to the La. bayou region…haven’t heard the term for many years..
On a lighter note I don’t believe anyone ever expired from it although those suffering from it might argue otherwise.. Still waiting for you to find me a mid 60’s gal who can back up a boat trailer. You are so funny, G. I can always count on you for comic relief! Well, I made up that term quite a few years ago as the best way to describe it. Oh, I’m sure it blows down on the north wind every year from NY. Another thing to thank the Yankees for, LOL! I’m still looking for the mid sixties gal who can back up a boat trailer for ya! Oh, gosh. I’m back in town from my Christmas travels and am so sorry to hear about you being sick on Christmas Day. Somewhere I read a blog entry today written by someone who was celebrating NOT being sick on Christmas, for the first time in years. I just want you to know that “creeping crud” was a common affliction in Iowa in the 50s, too. For all I know, it’s still there. And a friend who grew up in Arkansas mentioned over Christmas that she’d had it. You’d think they would get a vaccine! The best vaccine is to hit it with a triple punch—2 capsules of nettle, 2 of astragalus, and 2 of echinacea, chugged down with large volumes of pure OJ. Christmas night, I thought I would cough up a lung before it was over, and the next morning, my recovery was darn near miraculous!!! Merry Christmas!! I too try to carry on some of the traditions my Mom started.. I make her fruit drop cookies and put out her decorations. Christmas Eve is always party food – cocktail meatballs & lil smokies, chips/dip, etc. My Dad, well, his tradition was going to Walmart on Christmas Eve scrambling for a gift and I’m not doing that. LOL! Sure do miss my parents at this time of year and wish my girls had gotten a few more years with them. They only had three Christmases with my Mom and they do not remember much. They will never know what it’s like to go to grandma’s – or anywhere- for Christmas. My family had our Christmas dinner today and we always have cornbread dressing, homemade cranberries, peas, butter beans, string beans. Sister Shubert rolls. pecan pies and strawberry cake! Oh I forgot: indigestion!!! We had a good time. I am thankful we are all well and that,s all that matters anyway isn’t it? Being well is most certainly a gift in and of itself! Sounds like y’all had a great Christmas meal, but you didn’t mention traditions. Do you have any besides the foods you prepare? Happy new year, Louise! Thanks for joining the ranks of faithful readers here! My only traditions are that we always eat at my house and my grandsons that live near, Elijah and Abram, decorate my tree and do a good job of it. My older son Darin went to Israel and brought an olive wood nativity set for me that I always put out since 1987. I was so tired I did not realize I left my tradtions out!!! So glad you came back and shared them with us! I truly enjoy reading your columns.I have always been interested in hearing & reading about the ways & lives of the past. I have always had Christmas at my house, but no longer can handle it, as the family grows & grows. I really miss it a lot & Christmas just isn’t the same!!! I am really think about next year! I won’t be breaking my neck cleaning my house before & after the party, & also not doing a lot of cooking, but having simple stuff, such as sandwiches, dip & chips, baking a cake & other snacks!! !I just need to get all of the family back here again!!! Wishing you a your family a very MERRY CHRISTMAS!!!! Welcome to this bayou blog, Joyce, and it is such a privilege having you here. (To my other friends here, Joyce is the mother of our premier fishing guide, Capt. Bill). We haven’t yet met, but I do see photos that Bill posts on Facebook. I know you miss having Christmas at your house, and maybe having just finger foods on festive paper plates, you might convince everyone to do Christmas at your house next year? We mommas do like to have our children around us don’t we? Happy New Year, Joyce, and thank you so much for leaving a comment! I think tradition was my mother’s middle name, especially at the holidays. She brought so many with her from England and I continue them today–the yule log, the fruitcake stir-up day with my sisters, greenery in the house, mistletoe, the shelf elf, and many more. Mom and Dad always had open house on Christmas with lots of people coming to visit and the table loaded with sweets and snack-y type foods. And eggnog! I make it the way my mother did, separating eggs, whipping the whites to peaks, beating in the sugar, vanilla, yolks and milk, adding nutmeg…rarely do we spike it since the grandkids love it and beg me to make it! Those who fear raw eggs pale when I tell them my recipe, but it’s absolutely delicious. Merry Christmas, BW! For some reason, I had you on my mind a lot this week. Probably because I watched a TV movie set in Virginia/W. Virginia. I’m so ignorant about some things, because I’m just this year hearing about the “elf on the shelf”, and now you’re telling me it’s an old English tradition? Guess I’ve got some Googling to do after while! I’ve never had homemade eggnog, but it sounds good! Wendy, you write so beautifully. Thank you. Hope you feel better by tomorrow. Merry Christmas! Well, I was worse on tomorrow, but I’m starting on the mend today! Thanks for caring! So, you didn’t share a tradition with us, Mr. L.!!! I love your story. I no longer have my dad and miss him so much. He and mom were divorced when I was 6 and mom remarried and we moved into a sharecroppers house near my aunt & uncles home. My grandmother and her youngest son (about 10 yrs older then me) lived with them. Every year about Thanksgiving or just after, mom, my aunt and grand mother made the no-bake fruit cakes. They screwed the old hand cranked food grinder to that red/chrome formica table top and begin to grind the ingredients which went into a #3 wash tub!! Once well mixed, they packed them into either 11″ or 12″ cake tins. They made about 6 of them in all. We got 2 that mom put under my bed to store until Christmas with a dire threat if we touched them. 🙂 One always had a good dose of whiskey or rum poured over it before sealing it and I could smell that stuff every night! I continued making a small one until the past 4 or 5 years. I love them but, no one else does. So, I just buy a Klaxton one and nibble on it. This year, instead of having a huge family get together here as we normally do the weekend before or after Christmas, my husband and I will drive to our sons for an hour or so and then to our daughters for an hour or so. I knew the day was coming when it would be near impossible for them to all have the same day and hours off and it is here. So sad for us and it doesn’t seem like Christmas. We didn’t even put up a tree. My granddaughter and I did do a bit of baking today though and I split it all up to carry to their homes tomorrow. The college kids will be in about 3:30 for a couple of hours and we hope to see them. Before you and Steffi, I never knew anyone who made fruitcake. Why are fruitcakes the brunt of so many jokes? I’m wishing right this second that I had a slice of the little grocery store one to go with my coffee, now that my taste buds have returned from their Christmas vacation! To be honest, it wouldn’t bother me if we didn’t put up a tree, but I promised myself that next year will be better. Hope you got to see the college kids!!! Well, this has been a screwy year for me. Nothing has worked out as I would have liked. There are just a few traditions that got carried on this year. My daughter will receive a gift in a brown paper bag. My mom would always forget to wrap at least 1 gift every year, so it was placed in a bag. It seems it was usually meant for my #2 brother. So, after about the 5th time, she just put something in a bag. He was my daughter’s Godfather. After mom passed away, I took over and would send his gift in a bag. After he passed away in ’88…Brooke started getting the bag. Brooke and my daughters-in-law will get a pr. of Toe socks (for 19 yrs now). I’ll make my grandmother’s ambrosia tomorrow for my dad. My only surviving brother will pick Daddy up and bring him here for lunch. As you know, no fruit cake this year. BTW, I have my paternal grandmother’s recipe for Date Loaf, but I haven’t made it in a long time. Hubby and I LOVE it! I actually found some dates in the back of the pantry, They’ve been there at least 2 years. They’re probably petrified. Well, I’ve noticed that you’ve seemed a little scroogey this year!!! Sorry, I just had to say it. You’ve shared the brown paper bag tradition with us before, but I love hearing it again. Toe socks? Didnt’ even know you could still find those things. Ambrosia. Now that’s something I forgot to include in this piece—Mother made it every year, and again, mostly for Daddy, but I always liked it. I’m going to be making it as a blog recipe next year, God willing! So, what’s the history on this date loaf recipe? Where does this type of dessert originate? Anybody know? Did you open the dates? Were they still good? I hope you have a happier new year, Steffi! I’m really not sure where date loaf originated, but my grandmother was from German stock, coming over in the early 1800’s (?). On occasion, I would help my grandmother roll the loaves in damp dish towels. When she stopped making them, my mom started, so I helped her. Mom used to give them as gifts to the neighbors and her co- workers. We actually called the candy Date NUT Loaf. I didn’t open the dates or even look at the expiration date. They’re still in the pantry. I’ll get around checking them out eventually. As far as the toe socks, I used to get them at Wal Mart. This year I had to get them on E Bay. Of course, after I ordered them, I found some at a little store (more of a Deli) a mile from the house. I might go back next week. I actually liked those better than what I ordered. I’ll just stock up so I won’t have to go all over next year looking for them. Stocking up is a great idea! if you look back at my first mention of this mystery dessert we’re discussing, I referred to it as date NUT loaf, which is what Daddy called it! Somebody needs to resurrect said recipe and BW will make in the test kitchen next year!!! Hey, let’s BRING BACK THE DATE NUT LOAF, YO!!!! I’ll send you my grandmother’s recipe soon. Merry Christmas my friends, BW I believe that might be my most favorite page you have ever posted. But ya didn’t mention trucks, trains, prison…… wait that’s a song…. Never mind. It’s strange how we build associations with people, events and food in the south. Normal folks just eat to live but here food is an event in itself, it’s a celebration of life!. The procuring (hunting and fishing trapping), butchering and cleaning preserving (Charcuterie), and the preparation presentation, each in its own way a bonding experience. It might be the camp stories, the first deer, the rained out fishing trip or a friend sharing his meat when you got none. It might be the memories of the smell of the smokehouse while tending your Dad’s fire or scraping the hair off the old hog in the cold winter’s frost while watching a new young face learn where the meat in the grocery actually comes from. These are the places that young men usually bond and grow up learning by example some of those things that we all are supposed to know to be an asset to the community, to the nation. Then there are those of the food, the person making, the person sharing, the person eating and the family traditions that we carry with us. Oddly it’s never those that people plan for us to remember like the first time at the adult table but the odd quirks, the strange and ruined foods, the silly uncles and those people we will always miss. It’s almost like a heritage, yes a tradition. The worst part is you never realize how wonderful that memory is until it’s too late to recapture it or tell those involved anything. Oh and ours was date loaf candy, from the old days because dates were dried and considered exotic like pineapples and coconut and would last on the shelf FOREVER….. LOL Our ice box fruit cake was pressed together and you needed a jack hammer to get off a piece. Seriously and it was a tradition. I don’t cook on Thanksgiving or Christmas anymore. The niece’s/nephews do it so that they can start building their own memories with their kids. I gave both my nephews roasts for Christmas and they were happy campers. A couple a times a year, I will cook turkey and dressing the way I like it and have it when I want with no holiday time tables nor expectations. Maybe smoke a ham, and since the Sanity Clause came, looks like I am going to be making Andouille and sausages and beef sticks too this next year. Anyway, Thank you BW for sharing your memories. They are a private part of you. Mom always said that her recipe box was a list of fond memories from good friends. And I’ll quit here before I start off on another tangent. Hope you all have a safe and happy Christmas. I knew you’d be good for a couple of words, Goldie. Seems like you get your cooking “fix” in before the holidays begin, that way you can sit back and let the youngsters take over. How were the bonfires this year? Yes, I guess my memories are a private part of me, but I love reminiscing and also hearing others’ stories. You never disappoint. And I love what your mother said, “My recipe box is a list of fond memories from good friends.” Lovely. I gave some blackberry cordial as a gift yesterday, and they recipients actually liked it and were quite impressed that I had completed a project that took six weeks (I sort of have that short-term goal syndrome.) Happy new year, Goldie! And keep those cooking photos coming! The bonfires were great this year. They seem to be making a resurgence, its a new generation learning and building. They guys who did build are now watching their kids with a guiding eye using the chainsaws and building. Although it has become a more geographic specific celebration with the bonfires, I guess we should just be happy that some still do it. Its kind of like the Courir de Mardi Gras which was once just a standard accepted tradition, which now has slipped away everywhere except around Lafayette, Eunice, Mamou, etc. Once it was all over rural southern Louisiana. Thinking of trying my hand at Boudin this next week, have you ever made any? Suggestions? Recommendations? Secret ingredients? Oh, Goldie!!! That is a much older photo of the boys, but it reflected their visages so perfectly, that I had to use it.. . wonderful memories . . . . the cordial is better than ever after sitting bottled for a year . . .and no I have never made boudin, but i ate some killer hoghead cheese today from Bourgeois Meat Market, Thibodaux, LA. Yum yum! I thought as I was nibbling, hm, wonder if it’s worth the gore and trouble to try to make some mysef? And the answer? Nah, nibble nibble, yum!!! Well, you are most welcome, my new friend from 2013. You’re one of the few good things that occurred this past year! I’m really glad you made the trip down the bayou and got to hang out. I’m feeling better, thanks. Happy new year, Kim! My childhood memories: For some strange reason, I remember Uncle Bill having bugles at his house one year we visited for Christmas! The little sandwich bread at Grandmother and Nannie’s. I have some every New Years in their memory. Mom made the best fruit cake and gave some to Nannie every year. Your Dad’s wonderful singing, I can still hear his voice. I, too, think of him every time I listen to Bing. Spending every Christmas in north La. and crying when it was time to return home. Especially if it was snowing! I’ve always had a manger in my home just as Nannie did. Wonder what became of her’s? The date-nut roll at Uncle Kirby and Aunt Dottie’s house, I adored. Your Mom and and our Momma Kendel’s divinity was divine. I can’t make it like theirs. For about 20 years I wrapped presents in brown paper from a huge roll I bought cheap. Never had to put a name tag on the gifts because everyone knew who they were from. Ah, the wonderful aroma in Grandmother’s house when she was cooking. By herself because we weren’t allowed in there with her, not even to help. Cornbread dressing. I make it every year for Thanksgiving and Christmas using her recipe. Sorry to ramble. Thanks for sharing your heart with us. Have a blessed Christmas. I love you, Cuzzy. Wow, Cuz, you DO have some memories. Friends: Katy is my first cousin, but because she lived in New Orleans, we didn’t often get to spend holidays together. But I loved it when she and her two sisters came to visit–they seemed so sophisticated, being from the big city and all. You’re right. Grandmother Owsley never allowed anyone in her tiny kitchen to help her, but her food was so good. And do you remember what she would invariably say after the blessing? “Well, ‘taint fit to eat.” Yeah, right!!! Happy new year Cuz, and we can’t let another go by without a visit. Please? I understand your nostalgia, as I lost my Dad just a few months ago. It was difficult this morning, when my phone didn’t ring sometime about 6am, with him asking what we got for Christmas, as I would remind him (again) that we were all still sleeping. Strangely enough (I’m not an early riser) I would up just a little after 6am this morning. Maybe he was waking me to wish me a Merry Christmas after all!! Yes, Paulette, I heard your dad passed away a while back, and I thought of you during that time, wondering how you were doing. Dad probably sure enough did wake you up Christmas morning. What a special treat! I know you miss him, and it’s even harder when you’ve moved away. If he had any other special Christmas tradition, may I suggest you latch on to it and add it to your celebration? Whether it was a decoration, a certain food, whatever. I’ve missed you here, and hope that you have a blessed new year. What a lovely post, BW! We take these Christmas memories with us all our lives; and in the quiet moments we draw close to people we love, those with us now and those who have passed on. Christmas traditions are some of the most precious things we inherit from our parents and hand on to our kids. Ours start in September when I bake Christmas cakes. I live in the Netherlands now, but these cakes are an essential part of British Christmas, and I use a great-grandmother’s recipe from Midlothian (southeast Scotland). The cakes mature for a couple of months until in November I cover them with marzipan, then with icing; and send them to family and friends all over Europe and even a few to the US. On Christmas Eve we all go to the crib service at church, even though our kids (in their 20’s) have long outgrown being shepherds, angels etc. In the evening we have a traditional supper with a pretty table and lots of candles, and a big puffy oven pancake filled with hot spiced apples and dredged with white icing sugar. Our choir director always joins us as she can’t get home between the crib service and midnight mass—for us, Christmas is a time to share with other people. 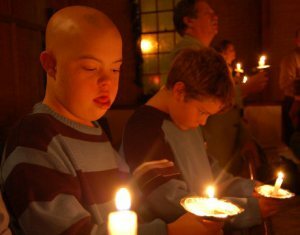 My daughter and I sing in the choir for midnight mass: like you, BW, I find those quite candlelit moments are when I draw into the light those so dearly loved who have died: my Mum and Dad, my parents in law, and others. I can feel them there with me. Christmas breakfast is the one I knew as a child: sliced navel oranges (my Dad could make the most beautiful, fine slices) with lovely red sprinkles of pomegranate, then toasted pannetone and coffee. (How as a kid I could think pannetone went with hot chocolate, I can’t imagine! 😉 Presents are opened one at a time, with much admiration and hilarity, then traditional Christmas lunch (a light salad, followed by turkey and gravy, tiropites (Greek feta and spinach turnovers for the vegetarians amongst us), mashed potatoes, sprouts and carrots, and ice cream—nobody has the appetite for Christmas pudding!). We always have one or two friends with us for the day–they add to the celebration for us, and Christmas is not a time for anyone to be alone. We watch the broadcast Christmas messages from the Dutch King and from Queen Elizabeth, which are simple and straightforward but very thoughtful. Today, Boxing Day (26 December), we go out for a walk in the dunes, and in the evening we go out for dinner with our aunt, the only one of the older generation left to us now. As we have moved between countries several times, these traditions are a lovely anchor point for our family. (In fact very November my older son always asks me to recite all the things we will do over Christmas, and if I miss out anything he corrects me!) For as long as our parents were alive, they joined us. These days, we try to make sure the family circle is enriched with friends and the beautiful joy of Christmas is shared across time and space. I hope everyone has warm, happy Christmas days! Ah, Christmas traditions and memories. Dad, his brothers and my Papa (grandfather) in the kitchen, hulling out the oranges for Granny’s ambrosia, talking ‘men talk’ and sneaking sips of some ‘Christmas Spirit’. Back then, it was the only time I’d see them drink anything stronger than coffee and they’d shoo us young’uns out of the kitchen, if we stuck our nose in the door. Granny’s coconut layer cake, which was only made for the holidays, as well as I can remember. Watching her crack the coconut and shredding the meat. The pine sapling that Papa would put up in the front parlor on Christmas Eve for us to decorate. A string of lights and few baubles were hung up. It came down the day after Christmas. Papa wasn’t a big fan of having trees in the house. It was a concession he made for the sake of the children. At Gramma’s (my maternal grandmother), when I was really young, I remember the coal fire in the living room fireplace. And wondering how Santa was going to come down that chimney with glowing embers at the bottom! Gramma always had a small table top tree, which was hung with those old bubble lights and glass icicles. It was put up a few days before Christmas or even as late as Christmas Eve. I could watch those bubble lights for hours. Gramma would leave her tree up until Twelfth Night, though we were long gone by that time. Mama with her store bought can of date nut roll, slicing it and spreading cream cheese on each slice. Mama was not much of a baker, unless she had a boxed mix. Even then, we never knew what the outcome would be. Mama stuffing pitted dates with pecan halves and rolling them in sugar. We would spend Thanksgiving with Mama’s family, Christmas with Dad’s, then New Year’s with Mama’s family (as a late Christmas). The next year, the schedule would be reversed. We never spent holidays at home; we were always on the road. Four hours to Mama’s family. A little over an hour to Dad’s family. We’d spend at least three days with each of them for each holiday. Oh, and I’m sorry to hear that you came down with The Dreaded Lurgy just in time for Christmas Day. Hope you’re back to feeling better soon. Thank you for the condolences on the Dreaded Lurgy, which I am now overcoming; however, Christmas day proper was awful! Well, so you have heard of date nut roll? with cream cheese no less. You have some interesting memories, too, Gue`. Thanks so much for sharing. I wonder if you liked all the holiday traveling as a child? Was it exciting, something to look forward to? Like an adventure? You helped me recall that we had plastic ice cycles hanging on our tree. And tinsel. Man, who buys tinsel any more? Hope your holidays are warm and fuzzy, my friend! While I now treasure those memories of Christmases spent with my grandparents, at the time, I hated all the traveling. I wanted a ‘normal’ Christmas at home, like all of my friends had. But it was not possible for the grands to come to us. We had to go to them. Oh, boy, the tinsel.. Mama reused the tinsel year after year. It was such a pain to get that stuff off the tree, untangled and put back in the box. I think most people eschew tinsel these days, especially if they have pets. It’s very dangerous, if they ingest it. I didn’t think they still made it but I was suprised to see a couple of boxes of it in Walgreen’s last week. My grandmother’s were still stuck in the Depression era mindset of “Use it up, wear it out, make do or go without.” – “Don’t tear the paper! We can reuse it. Save the bows! Save the boxes!” I have distinct memories of Christmas presents in those shirt or lingerie boxes with bits of several years’ worth of Scotch tape still sticking to them! Believe it or not, I still have tinsel from the tree we had when I was growing up! We put it on strand by strand, and took it off the same way, wrapping it around cardboard to keep it safe. I still have some of the 1950s/1960s plastic decorations that went on packages, too. One is white holly and berries, with glitter all over. That decoration went back and forth from one person to the next for years. We never threw them out, we just kept reusing. I miss Christmas caroling – we always went to nursing homes and hospitals, and through the neighborhoods. I suppose now someone would scream and yell and threaten to sue, but we always thought it was great fun – even the Jewish kids who’d come along with us! Food was such a big thing: Swedish Sprits, decorated sugar cookies, fudge, divinity, date nut rolls, spiced pecans, and a fruitcake cookie were the favorite sweets. On the Christmas table there was potato baloney, silta (like headcheese), salmon and herring, lingonberries, and cardamon seed buns along with more traditional American foods. And every single year Santa came to visit me. I’ve found a couple of photos – he came until I was about 18 or 19. Good Santa! I could blather on, but maybe this is enough. I surely do hope you’re feeling better.You need to be bright-eyed and bushy-tailed for the New Year! Seems I recall doing tinsel the same way on the family tree when I was a child, and I do recall wrapping the tinsel around the cardboard holder for storage until next year. You have great Swedish traditions, Linda. Some foods I’ve never heard of, much less eaten. Interesting how similar foods are made in different cultures, just with different names. Oh, and caroling. How could I forget that? We did this with a small group from church for many, many years. We had a geographical list and would caravan from the church building to the homes of the elderly church members who had become “shut ins” or nursing home residents. But I think the most reverent visits were when we were allowed to walk quietly through the ICU, singing softly as we went. We will never know whose hearts and souls were touched as we did so. Once, when we lived in town, The Captain and I took the three oldest children (all we had at the time) up and down our street, singing on front sidewalks, stoops, and porches. The two youngest we pulled in a red wagon, all bundled up for the cold. I’ll have to ask them if they remember doing this. Out of a dozen or so homes, only one old woman was rude to use, but it matters now. Memories. At the end of it all, those are the things that stick with us and which no one care take away, and rust and moths cannot destroy. Happy new year, Linda, and thank you for the well wishes. My eyes are brighter and my tail is bushier after reading everyone’s memories. Oh no! I guess there was no flue? (Is that spelled right?) I’ve never seen the bubble lights. Hi ho hi ho, it’s off to Google I go!!! Bubble lights were probably what gave inventors the ideal for lava lamps! They had a base with a rounded bottom and a glass, mini candle filled with colored liquid that had air bubbles go up thru the candle part as they heated up. We have flues in the fireplace but, they are not like any I have ever seen on a wood burning fireplace. These are permanently open and no way to close them off. We keep the chimney covered on top of the house. And I keep the screen that covers the front of the fireplace lined with a thick sheet of cardboard I bought from a printer. It is printed like a slightly cloudy summer sky. Keeps air from seeping in. I love reading your blogs. I feel your emotion in it as i read it. Thank you for sharing. Hope you and your family had a Merry Christmas. Hope you get better soon. I look forward to seeing y’all and eating crawfish with your little man this spring at David’s! Is it a date? Thanks for the sweet compliment, Megan! Happy New Year to y’all.